Growing up in South Africa, I became involved in politics at a young age. When I began studying for a law degree at the University of Witwatersrand – known locally as Wits – I joined both the South African Students Congress (SASCO) and the youth league of the African National Congress (ANC), the liberation movement whose most well-known representative was Nelson Mandela, our late president. I became involved because, quite simply, I believed in advocating for the rights of the poverty-stricken, marginalized black majority in our country. My activism with the anti-Israel Boycott, Divestment and Sanctions (BDS) movement started when I was elected to the Student Representative Council at Wits. I didn’t have much information on hand about the conflicts in the Middle East, specifically the conflict between Palestine and Israel. So I attended seminars and movie showings that aimed to educate us about the conflict. I was proud of my involvement with the BDS movement because I didn’t think any other people should suffer the injustices imposed on black people during the apartheid era in South Africa. in South Africa and brought about a democratic country for all our people.” This is code for the elimination of Israel as an independent nation, whereas a truly democratic solution would recognize the legitimate national rights of both Israelis and Palestinians. The key point about these activists is that they believe they are doing the right thing. In 2013, I was one of the BDS protestors who disrupted a piano recital at Wits, hosted by the South African Union of Jewish Students (SAUJS), which featured the Israeli pianist Yossi Reshef. All of us were convinced that our action was morally justified, and that a representative of an oppressive country like Israel should not be allowed on our campus. But the authorities at Wits took a different view, charging us with misconduct and ordering us to attend a disciplinary hearing. Eventually, the experience of that protest and the ups and downs of the resultant disciplinary hearing brought me to a stark realization: we were pushing an agenda that we knew very little about. We regarded the situation in Israel as equivalent to apartheid in South Africa. This conviction was what influenced my decision not just to protest the piano recital, but to protest the University of Johannesburg’s decision to grant U.S. President Barack Obama – whom the BDS movement views as a dedicated supporter of Israeli racism – an honorary doctorate. The reality is that the two situations are very different. I came to understand that the analogy of apartheid in Israel was an abuse of the memory of apartheid, just as it is possible to abuse the memory of the Holocaust or slavery in a similar manner. Where does all this propagandizing lead? In the case of the BDS movement in South Africa, it led to a boycott of Woolworth, one of the country’s biggest food and clothing retail stores. In hindsight, the targeting of Woolworth seems to be a tokenistic gesture. If the BDS movement was really serious about boycotting goods produced in Israel, they wouldn’t touch consumer technology, because many parts are either developed or manufactured in Israel. Instead, they focused on causing damage to Woolworth, without a thought for the black workers who could lose their jobs because of this false agenda. The BDS campaign wasn’t going to find alternative employment for these workers. Their only concern was to hypocritically denounce Woolworth for supposedly ignoring “the principle of responsible citizenship” by “importing products from Israeli companies in violation of the international boycott of Israel called for by the indigenous Palestinians” – insinuating that the Jews, who have maintained an uninterrupted presence in that same land for three thousand years, despite numerous attempts to eliminate them, are trespassers and not indigenous. So the question arises, why claim that Israel is an “apartheid” state? The BDS campaign uses this terminology to attract South African blacks. BDS understands very well that any black South African who knows the anti-apartheid struggle will be attracted to a campaign that combats apartheid elsewhere in the world. Anyone who takes a different view of Israel is subject to intimidation. It was difficult for me to even visit Israel because of the threats I received from BDS prior to leaving, such as a July 2015 email, which threatened anyone traveling to Israel with “serious disciplinary action” and accused participants of being “complicit in the bloodshed of our Palestinian counterparts.” What is it that the BDS campaign is hiding? Why can’t they let people visit Israel as they please, without harassment? Why do they deem it wrong to visit Israel? Surely, anyone interested in this issue should actually travel to Israel and Palestine to learn more, if they receive the opportunity to do so. As in North America and Europe, BDS has been an extremely divisive presence on South African university campuses. During Israel Apartheid Week, Student Representative Councils (SRCs) are prevailed upon to issue statements in support of this campaign. Most of the SRCs are controlled by the Progressive Youth Alliance (PYA), itself composed of supporters of the ANC, the Communist Party, and the Muslim Students Association. The involvement of this latter group means that much greater attention and support is given to the BDS campaign. The results of this strategy illustrate the thin, perhaps invisible, line between antisemitic activity and BDS advocacy. During the most recent Israel Apartheid Week, three Jewish students were beaten up in a shopping mall in Johannesburg. In another notorious incident, the SRC at Kwazulu Natal University demanded that the rector expel Jewish students from campus. The Secretary of the SRC, Mqondisi Duma, said: “As the SRC, we had a meeting and analyzed international politics. We took the decision that Jewish students, especially those who do not support the Palestinian struggle, should deregister.” Rightly, the university authorities dismissed this demand as “totally unacceptable,” but the problem of antisemitism embedded in BDS campus activities remains. I know this to be the case, because I had the same attitude when I was part of the BDS movement. BDS encourages you to hate every Jew in the world, see the worst in them, and label them as oppressors, killers, and land thieves. An organization that pushes such ugly indoctrination clearly wants to intimidate the Jewish community. BDS in South Africa sustains itself by pushing lie after lie. The history they provide of the Israeli- Palestinian conflict is woefully inadequate. Israel is cast as a state born in 1948 in “original sin.” The centuries before 1948 are never mentioned. The complex history of Jews and Arabs, along with the sacrifices made by oppressed Jews from Europe and the Middle East who returned to their homeland, is ignored completely. In terms of today’s conflict, Hamas terrorism against Israeli civilians is portrayed as “resistance,” rather than an attack against a peaceful solution. During Israel Apartheid Week, the BDS campaign falsely presented horrifying pictures of children killed in Syria as Palestinian children killed in Gaza. The deception continues. 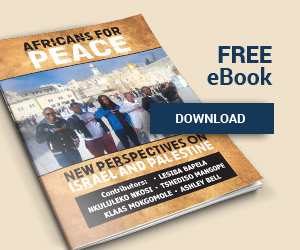 BDS feeds hatred, and what we need in South Africa is an organization that educates for peace. South Africans involved in BDS need to be given the opportunity to understand that this is a conflict in which both sides have legitimate rights. If we South Africans expect people who comment about our country to know the history of apartheid, then we must apply the same standards to ourselves. In the end, there is no substitute for one’s own careful research. As a former BDS activist, I encourage those involved in BDS to not blindly believe everything the movement says – because if you accept their propaganda uncritically, you are not contributing to peace, but to further needless bloodshed.